FLY ON RED WHITE AND BLUE! We convey honor, pride, and appreciation due. With a message of freedom to all you send. Let stars for the states stand out. With a proclamation of liberty they shout. For a nation that's ever all others led. O’er the bounty of this land that so pleases. That sends testimony of hope to all. As a reminder of ineffable victories bold. As help is granted with an extended hand. Even though you fly where some do object. When taps are played as homilies and prayers are said. To protect you with great prowess and vigilance. You are a sacred part of America, and to you we remain true! 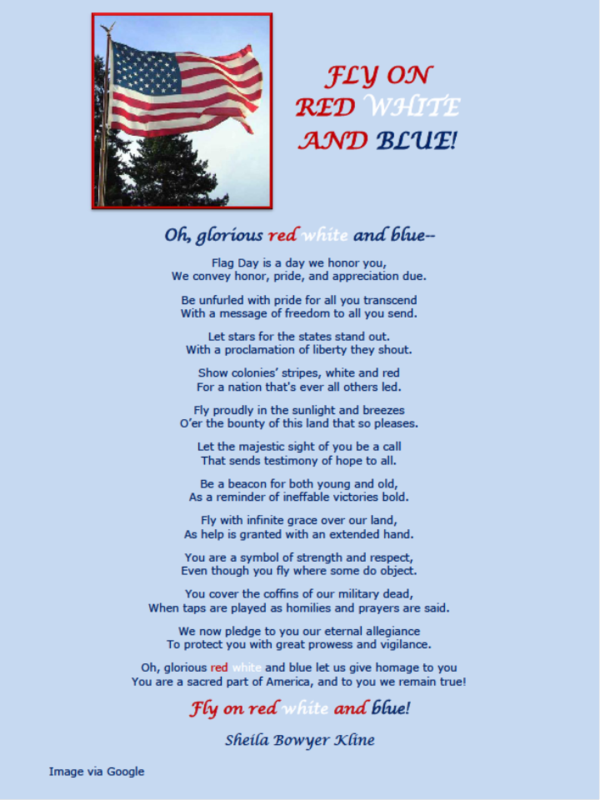 This is one very AWESOME poem and Tribute to our American Flag! I LOVE it!